Oiibo pet terrarium is made of high-quality glass to increase the transparency, it can give you a fascinating visual experience. The top frame uses the aluminium material to prevent the rusting problem. Metal gauze screen top provides well ventilation, it's also removable to help you adjust some decorations in it. 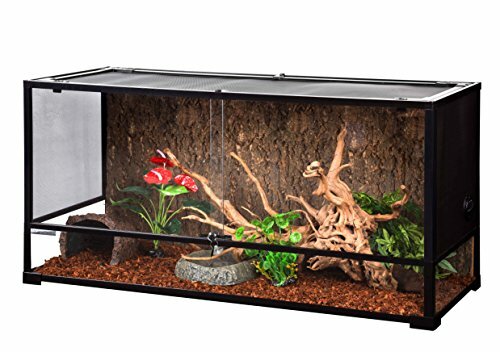 This terrarium is suitable for varieties of reptiles & amphibians & insects! like snake, lizard, turtle, frog, tortiose, gecko. The top frame can circulate the fresh air, you can also change the side glass with the gauze in the summer season. Its double opening door design makes your maintenance and feeding in the terrarium easier & convenient, avoiding the risk of hurting your pets. Knock-down design makes it easy to move & transport, especially when it occurs some move situations, like from the room to another one, from the floor to other floors, or for some large scale reptiles breeding owners, this knock-down design is the best choice to do safe transportation. It has the waterproof in bottom of the terrarium, which can hold certain volume of water to do some aquatic decoration. Meanwhile it can hold enough bedding material to meet some kinds of reptiles' digging & belowground hide's need. The terrarium adopts high-quality glass to improve the appreciation experience & the top frame is made of high-quality metal material to hold some repti-lamps. Knock-down design makes it easy to move & translate, especially when it occurs some move situations, the design can insure its safety. Double opening door design reaches an overall feeling view coordinated, allowing an easy access for maintenance and feeding. Each two-side glass can be replaced by the metal gauze to meet your different ventilation needs, while in the side-glass/side-gauze equips a multiwire outlet switch to help you install some repti-equipments in it. Waterproof bottom can hold water to meet some special aquatic decoration needs, while it prevents animal waste & bedding material from leaking out. If you have any questions about this product by Oiibo, contact us by completing and submitting the form below. If you are looking for a specif part number, please include it with your message. Zoo Med Labs Reptisun T8 Terrarium Hood, 24"
Exo Terra Terrarium Cabinet, 24"